Bwindi Impenetrable Forest is 330 km square; 1160-2607m ASL; includes lowland forest with rare Afromontane vegetation on the peaks; forest is very old at around 25,000 years (this was one of the few “refugia” that survived the last ice age; home to 320 mountain gorillas in 15 troops; mountain gorillas are tracked from Buhoma and Ruhija in the north and Nkuringo and Rushaga in the south, (350 birds including 23 Albertine Rift endemics; 310 butterfly species; 120 mammals including 11 primates; 200 tree species; around 30 forest elephants in the south; Bwindi area has the densest human population in Uganda with around 350 people/square km. The annual average temperature is 7-20 degrees C. The area is usually cold in the early morning and at night; the coolest time of year is generally June and July. Bwindi has a short rain from March to May and heavy rains in September to November. June to August is usually driest but expect soft rain at any time of year and bring wet weather gear. The two main areas in Africa where the Mountain Gorillas are found are Bwindi and Virungas. The biggest constraints to gorilla tracking are gorilla permit availability and suitable accommodation. June to August are the driest months, theoretically considered the easiest months for gorilla trekking; March to May the wettest, therefore usually the hardest treks. The “Virungas” are about 450 km square and is an ecologically homogenous area covering three contiguous National Parks in Uganda, Rwanda and DRC called the Virunga Trinational Conservation Area. 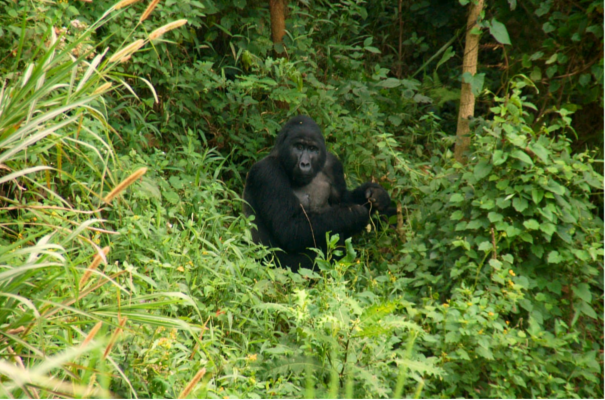 This combined area has about 386 individuals including 5 habituated groups in Rwanda and 4 habituated groups in DRC. Nkuringo, on the southern edge of the park, became Bwindi’s second gorilla tracking trailhead in 2004. Tracking the Nkuringo group of gorillas is strenuous, for their forest home lies a full 600m below the trailhead at Ntungamo village on Nteko ridge. Walks along the ridge-top road provide superb views north towards the forested hills of Bwindi and south to the Virunga volcanoes. There are also opportunities to learn about the Bakiga culture through village walks, vibrant dance performances and cultural workshops organized by community groups around here. Nshongi trailhead, in the southeast of the park opened for gorilla tourism in 2009. Three groups (Nshongi, Mishaya and Kahungye) can be tracked from this point. The trail descends into the depths of the forest directly to the south of the park. Furthermore, this area offers village walks, bird watching and a spectacular waterfall. Bwindi has 5 different walking trails – good for birds (190 recorded in the Buhoma area), looking for other forest dwellers (monkeys to butterflies) and simply enjoying the scenery. All except the Muyanga River Trail require a UWA guide costing around $15 for a day’s trail. Walks last anything from 30 minutes to 8 hours. Muyunga River Trail – follows the Bizenga River in the valley directly below Buhoma. No guide required, very easy going. Good for birding in the early morning or late afternoon. Waterfall Trail – a 3 hour walk through pristine rainforest as it ascends the Munyaga River to the waterfalls. Good for orchids, ferns, trees and birds. Rushura Hill Trail – a 3 hour hill trail with good views across the western plains to Lake Edward and on a clear day views of the Rwenzoris in the north. Muzabajiro Loop – a 3 hour trail that climbs up Rukubira Hill offering good views over the Bwindi Forest across the Western Rift Valley to the Virunga volcanoes. Ivi River Walk – an 8 hour trail leading to the Ivi River near Nkuringo on the southern edge of the forest – especially good for birds. This is a 3 hour trail with the possibility of visiting the local school, the Batwa community and learning about village life. A local banana beer brewery and traditional healer are good value.